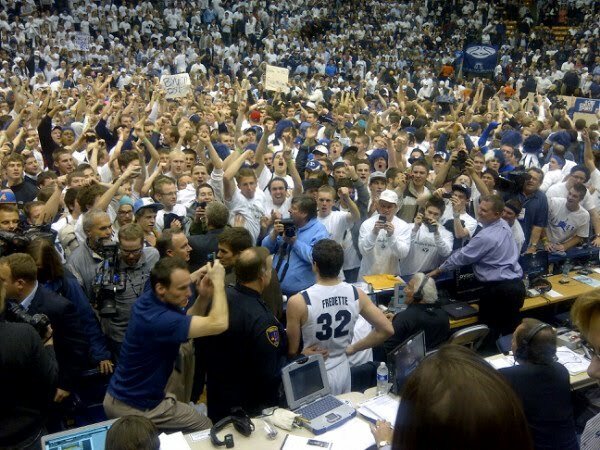 Jimmer Fredette has picked his spot nicely. In the biggest game of his season last night -- hard enough to catch on TV (CBS College Sports, which had even me looking for an illicit internet video feed) that it almost felt more interesting, like watching Prince at a small club rather than an arena -- Jimmer had 43 in a W.
And it felt... quiet. Not just quiet: Easy. As quiet as 43 can be in an arena packed with rabid fans. Just look at this photo -- it was taken not by a pro, but by Jags LB Kirk Morrison, who was just there to watch the game. We have had smaller-school college hoops phenoms recently -- Stephen Curry, Adam Morrison -- but Jimmer is the first real one of the Twitter Era, where buzz can elevate "CBS College Sports" to a Twitter Trending Topic (to be replaced by "Jimmer," undoubtedly). His NBA future? He is expected to be a 1st-round pick, and like super college scorers who are presumably odd NBA fits before him -- like Curry and JJ Redick -- his stock will go up and he will go in the Top 10. Someone will do it. His NCAA Tournament future? Curry made it deep into the second weekend. I'm not sure Fredette will get that far, but it sure would be good for the sport and the event if he did. San Diego State is no joke; that was a Sweet 16-quality win (if benefiting from home cooking). But those are for another time. For now, it's just Jimmer the Rock Star, the big story of the day. Li Na is going to take over the world: When you become an instant sensation with a billion fans in China, you tend to move the needle. This showed up on Quickish this morning -- more fans could watch the Aussie Open women's final than the Super Bowl... by a lot. Federer KO'ed: He's just not the same anymore. Hope you enjoyed his dominance while it lasted. Tonight: LeBron and the Heat at Madison Square Garden. I think they beat the Knicks by 20, even without Chris Bosh. These Knicks could barely shake off the Wizards on Monday. NFL union civil war? I'm dubbing it "Going Crogue," because Antonio Cromartie has been spouting off in ways that undermine the union's cause, so the union -- in a bit of a panic -- asked some members to tweet out their support. It came across as somewhat desperate; you're so afraid of a single player? Doesn't say much for the strength of your hand.